Houseplant notebook, £3 from Jacqueline Colley. I am a strong believer in asking for exactly what you want for Christmas - I’d rather get one thing that I absolutely love and strongly desire, than ten gifts that I am going to stick in a drawer. With that in mind, here’s my pick of planty gifts to give to your loved ones (or yourself!) this Christmas - all made by small businesses or individuals. If you want to give your hard-earned cash to an actual person who pays taxes and works hard to provide you with excellent customer service, look no further. Stick this in front of your nearest and dearest, or hell, even just order something yourself and put it away to open on December 25, safe in the knowledge that a) you’re guaranteed to love it and b) you’re helping to support an independent artist, craftsperson or gardener. We all need more plant pots, but if you’re bored of the bog standard white pots you always buy from IKEA, now’s a chance to branch out. These organically-shaped pots are perfect for succulents and look as if they’re made out of a lump of rock: they’re made of concrete, perlite and hypertufa. Also check out her stone hand planters, which are really unusual, too. As the name suggests, Miss Odette’s Plant Emporium also sells plants! Prices start from £6.50 plus P&P. Monstera leaf, Chinese money plant or saguaro cactus, these stamps are the perfect way to personalise your stationery such as notecards, letters, envelopes and so on, or pieces of fabric. One of my favourites is this lily of the valley stamp. Ewa lives in Poland and designs and handcrafts rubber stamps, often with a planty theme. You can also follow her on Instagram as @szczepanskaewa_. Prices start at £6.40 plus P&P. I am not sure how I stumbled across Linda K on Facebook, but I knew immediately I wanted a set of her crochet cachepots. I just love the way they look, that they’re handmade from 100% natural yarn and that you can even wash them! They cost £20 plus P&P for a set of three and you can select colours from a wide range (see the options here, all the same or a different shade for each pot, it’s up to you). I opted for black, to match my existing pots, but you could go for something wild and Christmassy if that’s your thing. I am a big fan of Jacqueline’s work, which is why she is redesigning my podcast logo for me! This cactus print would make a wonderful addition to any houseplant-packed room. It is a Risograph print: a process similar to screen-printing, where the printer creates stencils and the colours are layered one at a time. Do check out Jacqueline’s other work, which includes this awesome print of the Barbican Conservatory in London, and this houseplant notebook which at £3 is the perfect stocking filler. Cactus print £20 including free UK shipping. 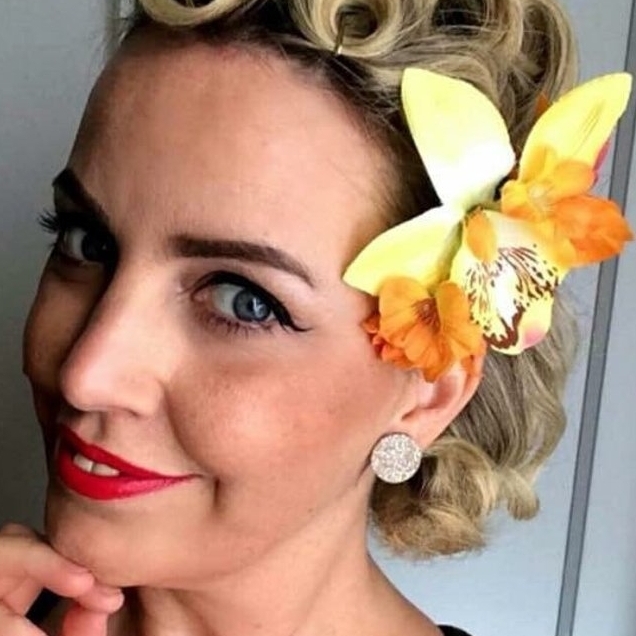 Pinup tropical hair accessory, £8 plus P&P from Rubyboomakes. If you want to look just as exotic as your houseplants this Christmas, check out these gorgeous hair accessories made by a friend of mine, available via Etsy. Rubyboomakes has a background in fashion and costume, and she really puts her heart and soul into these creations so you won’t be disappointed. Repurposed Christmas decorations often feature in Rubyboomakes’ designs and she also reuses packaging when sending out her orders. These hair accessories are made from artificial flowers, so you’ll be able to bring them out year after year, and there’s an option to request a custom order too. Prices range from £8 to £20 plus shipping. I love macrame plant hangers as much as the next houseplant grower, but I do feel they need an upgrade from the 1970s versions. Julinka Handmade’s brightly coloured hangers come in shades of red, blue, orange, aquamarine and more. At £7 each plus P&P they’re a great stocking filler for your planty friends, too. If you’re a fan of subtler colours, she offers those too, plus double and triple plant hangers to make really efficient use of your space. I admit it, I am a sucker for stationery, and for things with Monstera leaves on it. But the best thing about this planner from Lucie Forejtová? Well there are several. First, it’s made from recycled paper - it’s also zero waste, and there are lots of options to personalise your gift - from choosing your own start date to lined or plain paper. There’s even a vegan option where beeswax used on the thread can be substituted for soya wax. Neat. Prices range from £9-£12. If you are a veg grower and want to keep track of when to sow what, this is a brilliant calendar for your kitchen (or potting shed) wall. Size-wise it’s A4 opening to A3 with plenty of room to add in Grandma’s birthday and when you need to take the dog to the vet. No dig guru Charles Dowding ‘s beautiful veg garden is shown through the seasons, and there’s growing advice from Charles to follow too. Price £10 plus P&P.